Here's our hardworking National Youth Choral Festival Lab Choir, which rehearsed for five hours again today, Sunday, under the direction of Education Director Ben Johns. 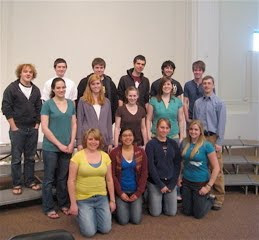 The Lab Choir consists of 13 students from 4 Bay Area High Schools ( Acalanes, Analy, Concord and Davis) which are regular participants in our Singing in the Schools program. They have volunteered to be the demonstration choir for Vance George's sessions with the choral conductors at our national festival, coming right up.